With three squeezable Wheel Pals racecars to zoom down three race tracks, there's sure to be an exciting finish every time. Race one, two or all three at once with fun racing sound effects. Give each vehicle a little squeeze and push it across the floor. Each roll-along friend greets your little one with a friendly expression. Perfectly squeezable and sized just right for your toddler's hands, Wheel Pals encourage on-the-floor fun. 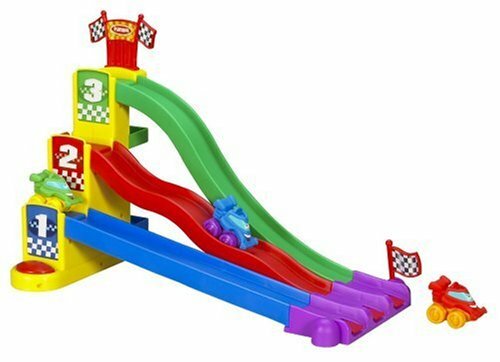 The electronic racetrack encourages imaginative, hands-on play with 3 tracks, 3 racecars, finish line with checkered flag, starting gate and instructions. Requires 2 "AA" batteries (included).